Edwards Breakfast Sausage for sale. Buy online at Zingerman's Mail Order. Gourmet Gifts. Food Gifts. 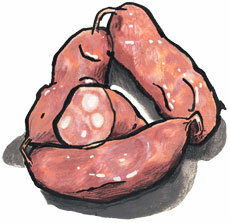 Smoked sage sausage links from Virginia. This is some of the best sausage I’ve ever eaten. Made with fresh pork, sage, black and red pepper, a touch of sugar and smoked over green hickory for fifteen hours, it’s meaty, sweetly smoky and very flavorful. Sam Edwards' favorite way to enjoy it is to cut it into what he calls “coins” (slices) served with fried apples or mixed in with scrambled eggs and cheese. However you choose, this is real and tasty American slow food. Sausage links will freeze well for up to six months and last for a few weeks in the fridge.